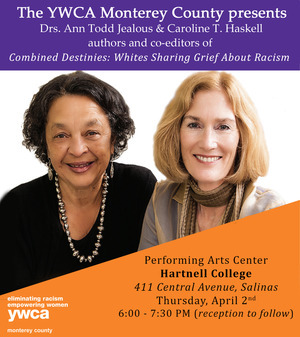 Please join Caroline and Ann on Thursday, April 2nd from 6:00-7:30 PM at the Performing Arts Center at Hartnell College, 411 Central Avenue, Salinas, for a discussion about how racism affects not Blacks, but Whites. 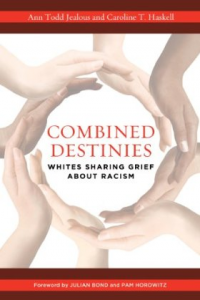 Together with contributing authors featured in their jointly edited book, Haskell and Jealous invite community conversation that encourages self-examination and compassion, inviting readers to look at how White Americans have been hurt by the very ideology that their ancestors created. The event is the second presentation in the YWCA Monterey County’s four-part Racial Justice Speaker Series called “Courageous Conversations”. Signed copies of Combined Destinies will be available during the event. There is no charge for parking and admission is free and open to the public. A reception sponsored by the CSUMB Office of Inclusive Excellence will follow the presentation and discussion.